How do you find motivation for dietary (or any other) change? Breaking comfortable patterns is difficult, so if you’re struggling, you’re not alone. I’ve recently begun studying frameworks for behavior change. 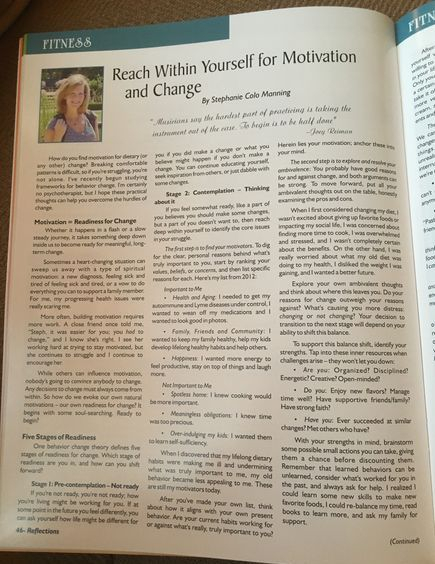 I’m certainly no psychotherapist, but I hope these practical thoughts can help you overcome the hurdles of change. Whether it happens in a flash or a slow steady journey, it takes something deep down inside us to become ready for meaningful, long-term change. Sometimes a heart-changing situation can sweep us away with a type of spiritual motivation: a new diagnosis, feeling sick and tired of feeling sick and tired, or a vow to do everything you can to support a family member. For me, my progressing health issues were really scaring me. More often, building motivation requires more work. A close friend once told me, “Steph, it was easier for you; you had to change,” and I know she’s right. I see her working hard at trying to stay motivated, but she continues to struggle and I continue to encourage her. While motivation can be influenced by others, nobody’s going to convince anybody to change. Any decisions to change must always come from within. So how do we evoke our own natural motivations – our own readiness for change? It begins with some soul-searching. Ready to begin? One behavior change theory defines five stages of readiness for change. Which stage of readiness are you in, and how can you shift forward? If you’re not ready, you’re not ready; how you’re living might be working for you. If at some point in the future you feel differently, you can ask yourself how life might be different for you if you did make a change or what you believe might happen if you don’t make a change. You can continue educating yourself, seek inspiration from others, or just dabble with some changes. Health & Aging: I needed to get my autoimmune and Lyme diseases under control, I wanted to wean off my medications, and I wanted to look good in photos. Family, Friends & Community: I wanted to keep my family healthy, help my kids develop lifelong healthy habits, and help others. Happiness: I wanted more energy to feel productive, stay on top of things, and laugh more. Spotless home: I knew cooking would be more important. Meaningless obligations: I knew time was too precious. Over-indulging my kids: I wanted them to learn self-sufficiency. When I discovered that my lifelong dietary habits were making me ill and undermining what was truly important to me, my old behavior became less appealing to me. These are still my motivators today. After you’ve made your own list, think about how it aligns with your own present behavior. Are your current habits working for or against what’s really, truly important to you? Herein lies your motivation; anchor these into your mind. The second step is to explore and resolve your ambivalence: You probably have good reasons for and against change, and both arguments can be strong. To move forward, put all your ambivalent thoughts out on the table, honestly examining the pros and cons. When I first considered changing my diet, I wasn’t excited about giving up favorite foods or impacting my social life, I was concerned about finding more time to cook, I was overwhelmed and stressed, and I wasn’t completely certain about the benefits. On the other hand, I was really worried about what my old diet was doing to my health, I disliked the weight I was gaining, and I wanted a better future. Explore your own ambivalent thoughts and think about where this leaves you. Do your reasons for change outweigh your reasons against? What’s causing you more distress: changing or not changing? Your decision to transition to the next stage will depend on your ability to shift this balance. Are you: Organized? Disciplined? Energetic? Creative? Open-minded? Do you: Enjoy new flavors? Manage time well? Have supportive friends/family? Have strong faith? Have you: Ever succeeded at similar changes? Met others who have? With your strengths in mind, brainstorm some possible small actions you can take, giving them a chance before discounting them. Remember that learned behaviors can be unlearned, consider what’s worked for you in the past, and always ask for help. I realized I could learn some new skills to make new favorite foods, I could re-balance my time, read books to learn more, and ask my family for support. Instead of focusing on self-pity and obstacles, we can choose to focus on resources, optimism, goal setting, or helping others. When we hear ourselves saying positive words and making arguments for change, we begin to believe these words and it increases commitment. On the other hand, if we’re giving arguments for not changing, we’re actually building a commitment to not change. If you feel like the advantages of change outweigh the disadvantages, or if you’re already discussing or taking gradual steps toward change, then it’s time to set a goal (see SMART Goal Setting at http://www.colokitchen.com/3-SMARTGoals.pdf). Anticipate obstacles: My head was in the game, but I knew external factors would interfere. So I made hard-boiled eggs for busy mornings, I never left the house hungry, and I packed a cooler for tournaments and air travel. Eliminate your triggers: I purged the pantry, avoided certain restaurants, declined the bread basket, and stopped buying junk food for guests. Create desirable cues: I stocked tons of leftovers, filled fruit bowls, prepared salads ahead, and carried cashews in my purse. Plan alternate behaviors to fill the voids: I drank sparkling water from a wine glass, replaced Doritos with unsweetened banana chips, ate before social events, and met friends for shopping instead of lunch. Ensure you have everything you need: I bought spices, ingredients, and some new kitchen tools. Publicize your intentions: I told whoever would listen. Ask others for help: I asked my family for help with kitchen clean up. Slips & Relapses: Progress is not always a straight path; slips are a normal part of change. We don’t learn new behaviors by performing perfectly all the time. Family/Social Pressures: The people closest to you can negatively influence you, as they feel affected by your new behavior. Involve them, explain your reasons for change, and request their support. Find a support buddy, join classes, or organize a support group. Stress: We often associate food with nurturing. 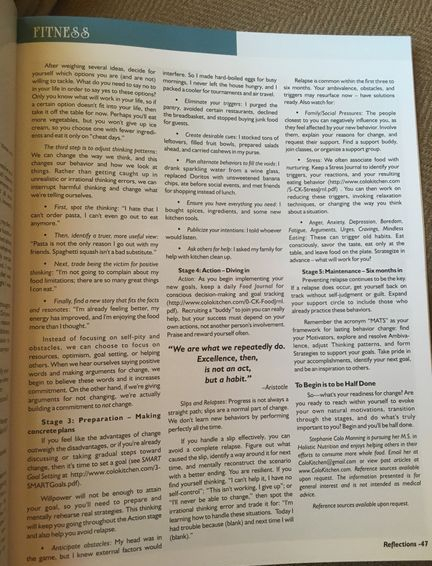 Keep a Stress Journal to identify your triggers, your reactions, and your resulting eating behavior (http://www.colokitchen.com/5-CK-StressJrnl.pdf). You can then work on reducing these triggers, invoking relaxation techniques, or changing the way you think about a situation. Anger, Anxiety, Depression, Boredom, Fatigue, Arguments, Urges, Cravings, Mindless Eating: These can trigger old habits. Eat consciously, savor the taste, eat only at the table, and leave food on the plate. Strategize in advance – what will work for you? Preventing relapse continues to be the key. If a relapse does occur, get yourself back on track without self-judgment or guilt. Expand your support circle to include those who already practice these behaviors. Remember the acronym “MATS” as your framework for lasting behavior change: find your Motivators, explore and resolve Ambivalence, adjust Thinking patterns, and form Strategies to support your goals. Take pride in your accomplishments, identify your next goal, and be an inspiration to others. So…what’s your readiness for change? Are you ready to reach within yourself to evoke your own natural motivations, transition through the stages, and do what’s truly important to you? Begin and you’ll be half done. Stephanie Colo Manning is pursuing her M.S. 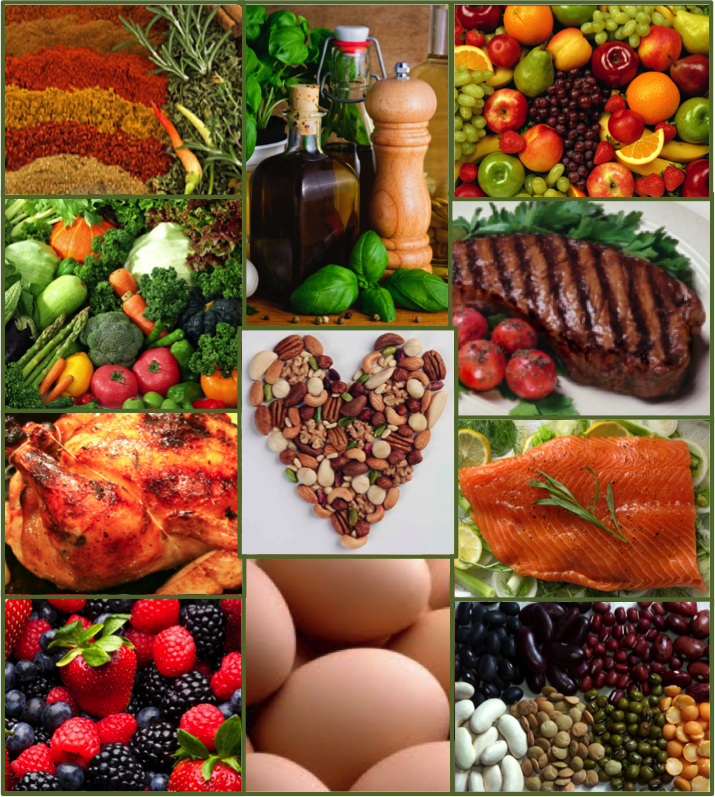 in Holistic Nutrition and enjoys helping others in their efforts to consume more whole food. Email her at ColoKitchen@gmail.com or view past articles at www.ColoKitchen.com. Reference sources available upon request. The information presented is for general interest and is not intended as medical advice. Reference sources available upon request.